When a group of gifted college students run a secret teeleportation experiment, they accidentally open a portal to another dimension, trapping them in hell. One by one they are hunted, tortured and killed by the denizens of hell who are bent on stealing their souls. 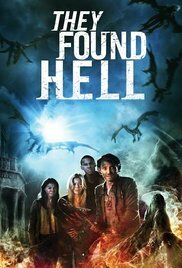 “They found hell” isn’t a cryptic or symbolic movie title. It’s just literally where a group of students ended up in this 80’s feeling Science Fiction horror. After ten minutes you realize that this isn’t a spectacular release for major cinemas. It’s a film suitable for the SyFy channel. Not only because it contains some absurdities or because of the somewhat dated special effects, but also due to the poor acting as well. But despite these shortcomings, I still managed to sit out the entire film. The most striking feature of this movie is the ridiculous short intro. After some craters appear in Russia (no idea how they turned up there and don’t expect any explanation) a group of young people hurry back to their lab to resume a kind of experiment with a teleporter. Before they know it, another flaming crater appears again (pitifully bad effects by the way) and almost the entire gang is drawn into this devilish hole. The lack of any explanation about the nature and purpose of this experiment caused the first irritation. Apparently the absence of all this is necessary to get the teenagers as fast as possibly there where they should be. And that’s hell. A devilish intro, so to speak. And that it’s hell where they ended up, is emphasized in the dialogue between the group members. The second irritation moment. It was a bit too much for me after hearing these ambiguous statements for the umpteenth time: “What the hell?“, “Where the hell are we?“, “What the hell happened?” and “It’s hot as hell down here“. And hearing for the thousandth time someone calling for help (meanwhile they surely realized it wasn’t really clever to yell loudly in this place) began to get on my nerves as well. And believe me, I lost count of how many times “Oh my God” was used. Were they hoping for help from a devine, heavenly person? It was obvious they were in hell. This was as clear as daylight after they deciphered a Latin phrase that was written above a wooden gate: “Omens relinquite spes, o vos intrantes“. A quote from Dante which was eventually spelled wrong as well. And yet there were also some positive points in this mediocre movie. I thought the decors were very successful at times. A chaotic and terrifying place where the victims were confronted with their own fears. They ended up in different places, which resulted in different angles of incidence. I got a real “Dungeon Keeper” feeling when watching this. Especially the demonic and repulsive-looking “collector”, pulling a rickety cart full of rotting corpses, was magnificent. The ferryman who could provide a possible way out (after paying of course) looked rather spooky. Some scenes were similar to those of other famous movies such as “Evil Dead” and “Saw“. Expect also some gore fragments (which were mostly a bit exaggerated). As befits a true B-movie, the performances were simply mediocre and at times really annoying. Most of them were unknown actors. And the final climax lay in the line of the entire film. Also incomprehensible and unexplained. Maybe it wasn’t the best SF/Horror, but I’ve seen worse. That’s for sure.